Excitement surrounded the newest addition to the 2013 AMSOIL Grand National Cross Country Series as the inaugural Car-Mate Gusher GNCC descended upon the Oil Region community on Saturday for the eleventh round of the 13-race series in Foxburg, Pa. Steady rainfall increased the obstacles throughout the freshly cut racecourse but nothing could stand in the way of Pennsylvania's very own Chris Bithell, who captured his first overall win of the season in his home state. 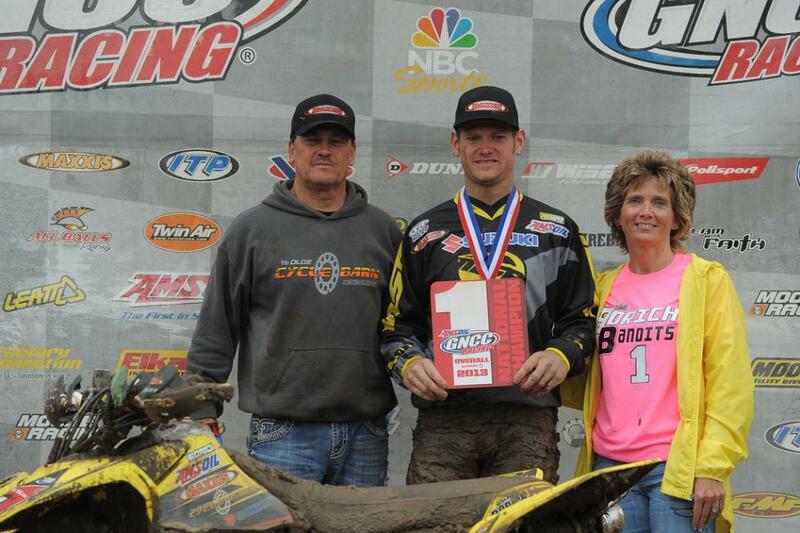 While Bithell took home the Round 11 victory, it was another Pennsylvania native-Chris Borich-who secured his fifth consecutive XC1 Pro ATV National Championship with a second place finish for the day. As the rain continued to fall, the afternoon race kicked off with Borich claiming the $250 DeRisi Racing/Team Woodhead Holeshot Award. From there, it was a close-knit battle to the woods on the opening lap between BNR's Kevin Yoho, Borich and DeRisi Racing's Eric Hoyland. However, it was the Reliable Tool Supply/Maxxis rider Bithell who checked in with the lead on Lap 1, followed by Borich, Hoyland and AmPro Yamaha's Walker Fowler. Precision/ITP/Lonestar/Axis/Baldwin Racing's Adam McGill experienced an issue on the start that caused the West Virginia native to start much behind the rest of the pack. McGill steadily worked his way through the pack where he engaged in battle with Hoyland, Henthorn and Gallagher for a top five position. Despite the heavy rainfall and muddy conditions, Bithell maintained a comfortable lead over the second place battle of Borich and Fowler throughout the two-hour race. Around the halfway point, Fowler began pushing his way up to the second place of Borich where the Ohio native eventually dueled for the position. The duo flip-flopped positions during the second half of the race but Fowler fell victim to a mud pit near the end, losing almost three minutes on the time clock. In the meantime, Bithell went on to capture his first overall win since 2010 as he bested the second place of Borich by one minute. 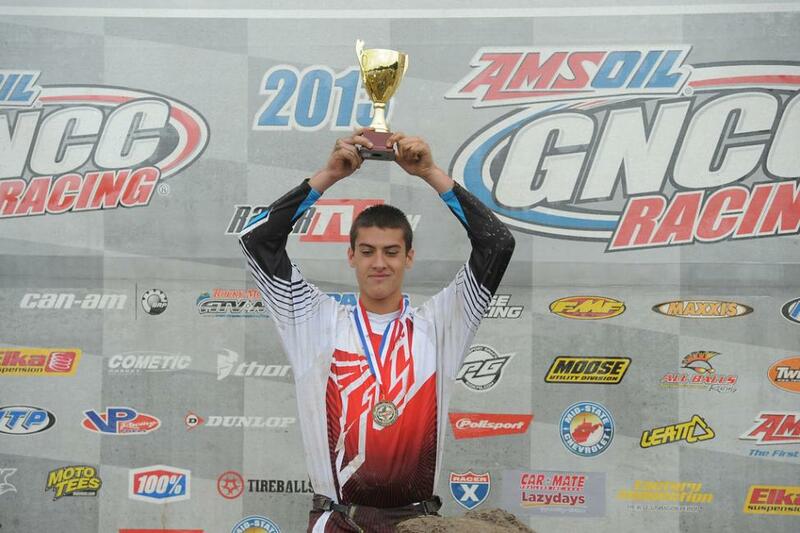 Bithell now joins the top three XC ATV racers in the nation as only the fourth GNCC overall winner this season. "It feels great to get the win today! 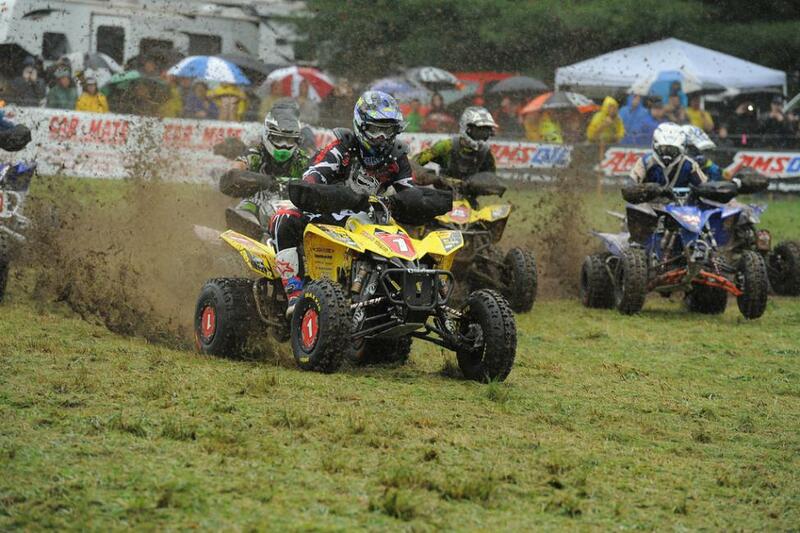 The Suzuki was working awesome and the Maxxis tires hooked up great," Bithell said. "It was a slop fest out there but the track wasn't really that bad once you got into the main line and once I did that, I never let off all day. Everybody was cheering me on and pointing me lines, it was a blast." Although Borich didn't capture the overall win at Round 11, a second place finish was enough to clinch the title with two rounds remaining in the season. 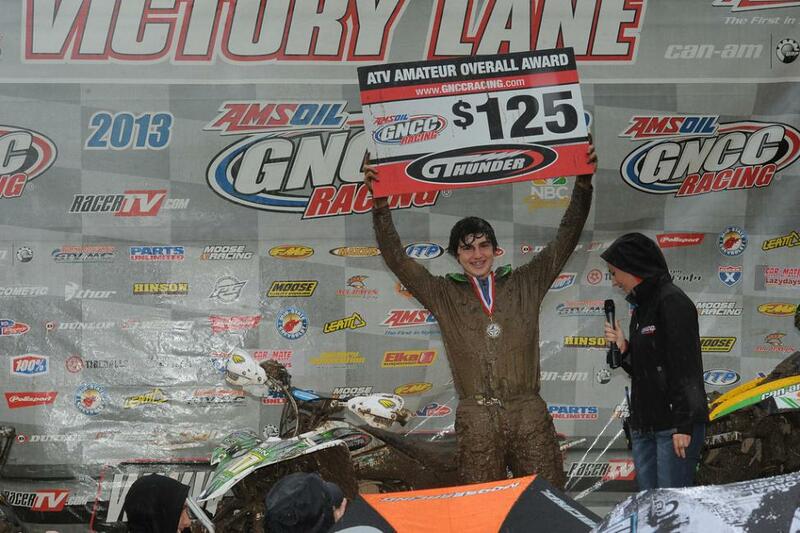 Despite a few issues on the last lap, Fowler was able to round out the overall podium with a third place finish. "It was a tough one out there today. It was definitely one of those days where you needed to slow down to go fast and make good line choices and that's what we were able to do today," Borich said. "It's kind of disappointing not winning today but the bigger picture is winning the championship." McGill secured a fourth place overall finish, just ahead of Waynesburg Yamaha/GT Thunder's Gabe Phillips, who secured a season best fifth place finish in XC1. Team Woodhead/DeRisi Racing's Braden Henthorn came in sixth, while HMF/GBC/Yamaha's Johnny Gallagher took seventh and Hoyland in eighth. GT Thunder's Brian Wolf finished ninth in the XC1 Class, while JB Racing/Cheerwine/Can-Am's Jarrod McClure rounded out the top ten. 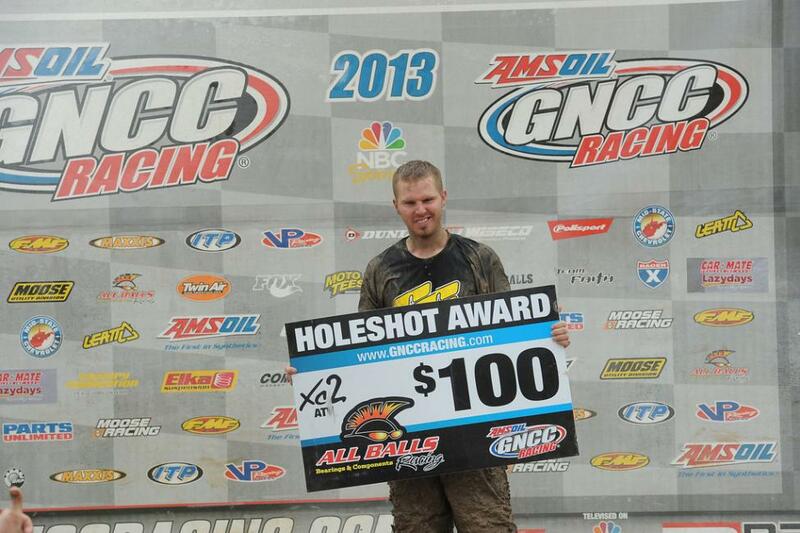 In the XC2 Pro Am division, Michael Lancaster grabbed the $100 All Balls Racing Holeshot Award amidst the slick conditions throughout the start-line area. However, Lancaster spun out in the second corner, where majority of the XC2 Class competitors got caught up in the carnage. Nothing could stop the driving force of Ohio's Brycen Neal, who put himself into the front of the pack early on. Reigning XC2 Pro Am Champion Patrick McGuire jumped in behind Neal, where he put forth a solid performance to finish second place for the day. After an eighth place start, Indiana's Fred Marley made his way through the pack where he ultimately finished third for the day. 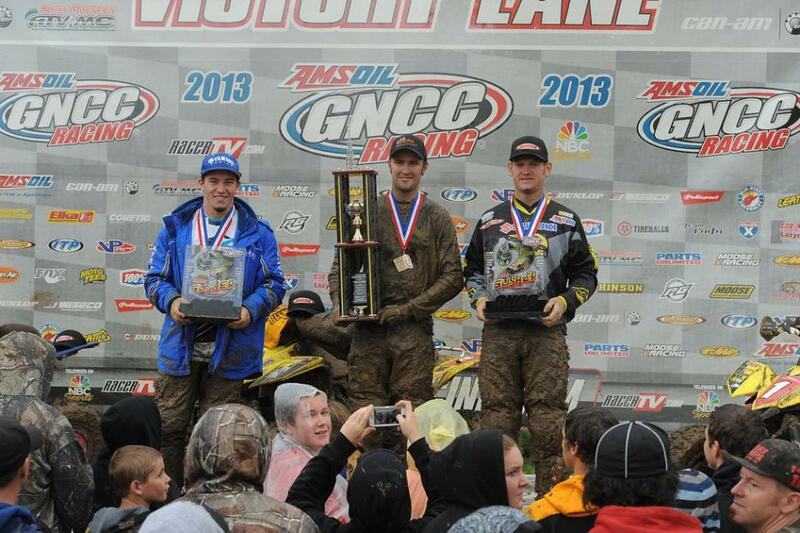 Neal went on to capture his eighth victory of the season, clinching the XC2 Pro Am title in his rookie season. Neal commented, "I'm going to try my hand in the XC1 Class next round at Powerline Park to see where I need to be for the 2014 season." 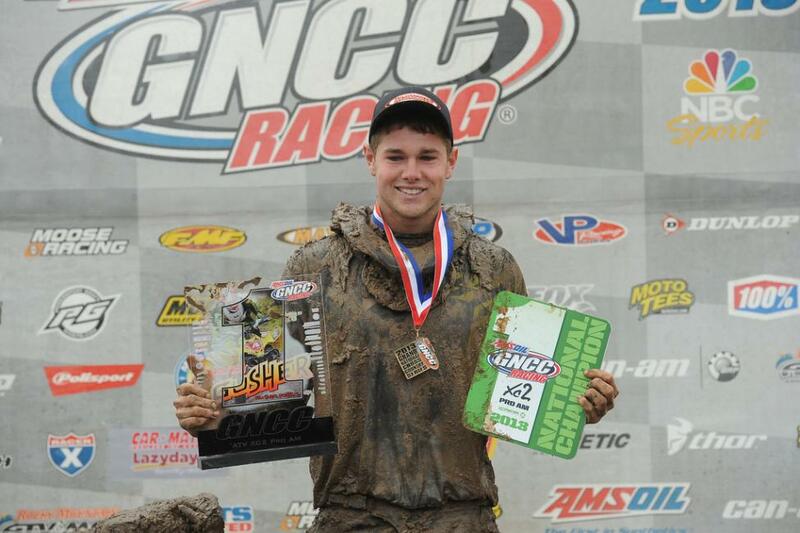 Finishing 11th overall for the day, Indiana's Marshal Goings earned the Top Amateur Award at the Car-Mate Gusher GNCC. Goings topped his closest competitor, Jay Shadron, in the College A (16-21) Class, capturing his fifth win of the season. In the 10 a.m. race, Ohio's Cody Collier claimed the top honors as he secured his second straight GT Thunder Overall Amateur award for besting almost 300 riders to claim the morning overall. In an ongoing battle with Maryland's Westley Wolfe, Collier also secured the Schoolboy (13-15) class win. Pennsylvania's Robert Smith captured second overall aboard his BNR Motorsports Can-Am machine, while Can-Am mounted Jordan Phillips rounded out the overall podium with a season best third overall. The 4x4 overall podium was topped by U2 class winner Robert Smith, with Phillips in second and 4x4 Lites Class winner Kevin Trantham rounded out the podium with a third place finish. In the Youth division, New York's Hunter Hart captured his ninth overall win of the season en route to his third Youth Overall Championship. Hart topped the 90 Open (12-15) Class, with Kalab Hagan and Seth Wilson rounding out the overall podium. 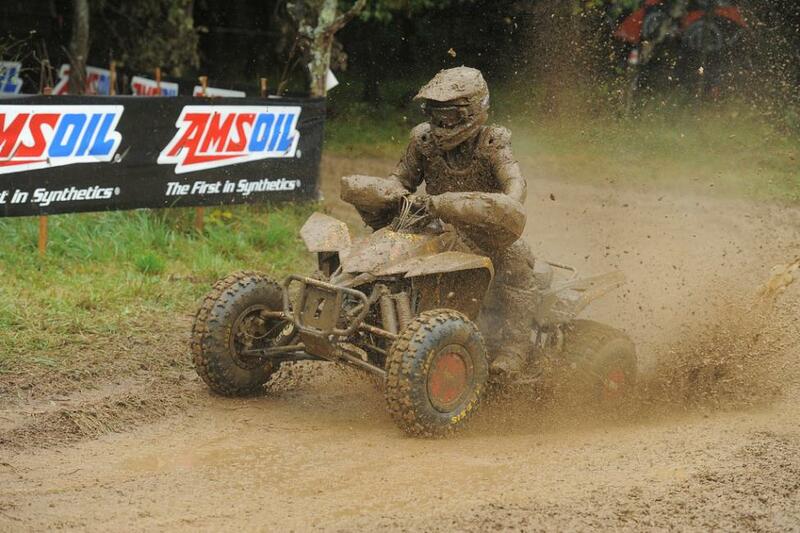 The 2013 AMSOIL Grand National Cross Country Series heads to St. Clairsville, Ohio October 12 and 13 for the ITP Powerline Park GNCC. For more information on the series, please visit www.gnccracing.com.